Stylizing your blog or website is extremely beneficial and has massive significance as it not only attract users but also looks neat and clean, mostly blogger and webmaster spends tons of bucks in stylizing and customizing their blog’s design which is indeed an upright move. When blogger provides codes in their blog they usually provide in the normal way, normal text writing that we usually do, “code is not text” we need to stylize it and also make it more prominent different from our plain text. To resolve the issues, we have introduced a Syntax Highlighter which is exceedingly popular in WordPress but now you have the luxury of using this splendid tool in Blogger BlogSpot blog. How To Add Syntax Highlighter To Blogger BlogSpot Blog? Adding syntax highlighter to a blogger is an enjoyable and uncomplicated procedure. We have created an exceptional Syntax Highlighter tool for your convenience so if you follow the following steps sensibly I am certain you will be able to get it right, now let’s look at the tool which we will use in this tutorial. Step#2: Now we need to choose the Brushes according to our needs, if you are a blogger then you might go with CSS and HTML, but this tool is not limited to bloggers even webmasters and programmers can make use of this tool. So just select CSS, HTML, or whatever you like and then hit the button which says “Generate code”. Step#3: Now copy all the code which is generated in the text area and then move to next step. Step#6: Now when you find the </head> ending tag, just above it paste the code which you copied previously from the Syntax Highlighter Tool. Congratulations! 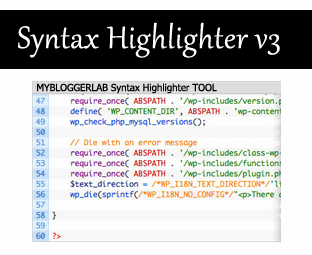 Syntax highlighter is now fully integrated in your blogger BlogSpot Blog. And now you can use Syntax highlighter with command. Now if you want to insert CSS coding in your template then Go to Blogger.com >> Post >> Add New Post >> Select Edit HTML Tab and paste the following code. Replace ADD-THE-HTML-CODE-HERE with your CSS style sheet coding. Don’t forget to replace ADD-THE-HTML-CODE-HERE with your HTML. If you have not integrated the Syntax highlighter correctly using our tool, then the possibilities are extremely high that you might notice a pop out which will indicate that something is going wrong. For Example, you are using <pre class='brush:css;'></pre> in your blog post but you have not included the CSS Syntax highlighter scripts in your header then you will see the following error. So we hope you have enjoyed the treat and make sure you use it with command till then peace, blessings and happy learning. I am thinking to add this, But I think that the default one is better. In Blogger we don't have any built-in syntax highlighter, so we decided to provide a quality syntax highlighter which is most recent one version 3.
and please solve this prob .. Thank bro. You have created great tool! Awesome! After various unsuccessful atempts with the old SyntaxHighlighter I found this one, infinitely easier to set up and nicer. Thanks, man! You saved my life! Thanks. This solved what i wanted to acheive.